Brighton & Hove Albion manager Sami Hyypia says he will not seek assurances about his position from chairman Tony Bloom or the board of directors. The Seagulls are just above the Championship relegation zone after nine league games without a win. "I don't need that," said Hyypia, whose side host Rotherham on Saturday. "Nobody has said anything else to me and we haven't talked about the situation a lot. I think it is an unnecessary conversation." Former Liverpool and Finland defender Hyypia, 41, was appointed Brighton manager in June on a three-year deal, inheriting a side that had finished in the play-off places in each of the last two seasons. "As long as I am in this position I know that I have the backing of everyone in the club." He won two of his first four league games and has led the side to the fourth round of the League Cup - but the Sussex club have not tasted victory in the Championship since beating Bolton on 23 August. Former Albion manager Alan Mullery, who is now a club ambassador, believes Hyypia deserves more time and Hyypia says he has not come under pressure from directors. "I haven't noticed or heard anything that would be different," he said. "If they put pressure on me or say something to me like 'it's not good, we have to win the next game or otherwise you can walk' then I would say straight away. 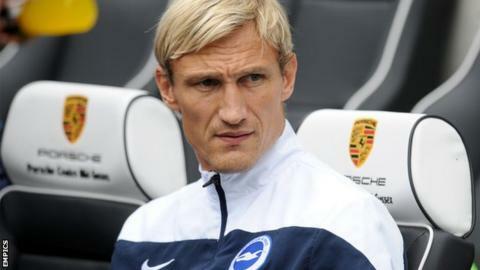 Hyypia, who was sacked by German Bundesliga club Bayer Leverkusen in April, is content that he has the support of Bloom. "As long as I am in this position I know that I have the backing of everyone in the club," he said. "When that day comes that they say 'thanks a lot - that's enough' then I know the backing is not there any more. "Until that day comes I know nobody has to say to me that I have their backing. I know it is there."